Posing at Kiki’s Vintage Photo Studio in South Africa. Anyone who knows me well knows this: fancy-dress parties aren’t my ‘thing’. I just don’t care too much about dressing up for the fun of it I guess, and I’m pretty sure the fear of looking silly has something to do with it as well. Haha! That said, I often find myself in situations during my travels where I’m invited to wear some sort of costume. I could have declined politely on every occasion but I never did. Before I knew it, I was dressed up as some character or other and posing for the camera. That’s the beauty of travel isn’t it? It somehow makes it so easy to overcome your inhibitions and yep, before you know it, you’re doing things you thought you’d never do! One of these occasions presented itself during my recent trip to Costa Brava in Catalonia: the Terra de Trobadors Medieval Festival in the town of Castelló d’Empúries (map). I wasn’t sure if I was going to enjoy it. The prospect of thousands of people crowding around some actors depicting a medieval-era scene didn’t sound very enticing. We walked briskly towards the town square when my host mentioned that we had to go to the Convent of Sant Doménec for our medieval outfits. “Erm, we have to dress up as well?”, I muttered. She smiled, nodded her head and, I guess sensing my apprehension, said, “Come, you’ll enjoy it! Everyone will be dressed up!”. “Hmm, I’m not so sure”, I thought but I followed her anyway. The Convent Sant Domenec all prepared for the grand medieval dinner at the Terra de Trobadors festival. As soon as we were ready, we were ushered to the town square where a big crowd had already congregated. To my surprise, many of the spectators were also dressed up in medieval costumes. There were court jesters, warriors, merchants, princes, princesses and many other characters. The atmosphere – surreal probably describes it best – was unlike anything I’ve ever experienced! In addition to the locals, I spotted foreign visitors all gaily dressed up in elaborate medieval attire; I chatted with a couple from England who came to Costa Brava specifically to participate in this festival. Many spectators were dressed up in their finest medieval attire. We were soon treated to a spectacular show with flame-throwers and horsemen, drama, dance and dollops of humour against the impressive backdrop of the basilica. A spectacular show of music, dance and drama. 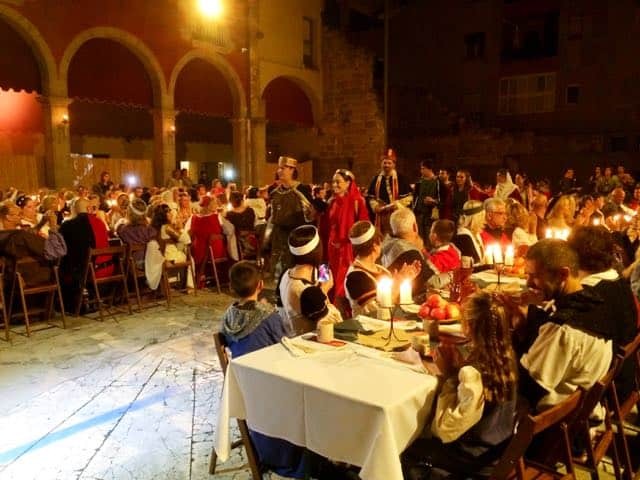 After the show, everyone who had tickets for the grand medieval dinner was invited to walk to the convent along with the musicians. This medieval parade was boisterous and fun, and I was so glad I was dressed for the occasion! We were accompanied by musicians to the grand dinner at the convent. We arrived at the convent and found our seats. I soon realised that one could not attend the dinner unless he/she was dressed in medieval clothing. Aha! The Count & Countess arrive for the dinner. Our hosts for the dinner. The musicians entertained as our hosts arrived. These girls came by to ensure that everyone washed their hands before dinner! And these boys brought us bread. As dinner was served, we were entertained by the musicians and a dramatic depiction of a sword-fight. The flame-throwers, court jesters and devil-like figures also made an appearance. The sword-fighting was pretty spectacular. At the end of the evening, I was happy to change out of my medieval outfit but there was no denying it, I had a fantastic time at the Terra de Trobadors festival! It really is a unique festival – what makes it so special is how (almost) everyone dresses up for it and joins in the fun. It was an amazing sight to sit at the dinner and watch hundreds of people in their costumes. Travel had, once again, taught me the value of losing my inhibitions for a moment and enjoying a whole new experience. This couple totally nailed it! The Terra de Trobadors festival is held every year during the second weekend of September. Aside from the evening medieval show in the town’s square and the grand dinner, there’s also a medieval market and a variety of fun activities in the town’s historic centre where artisans, travelling entertainers, jugglers and jesters entertain the public throughout the weekend. Read about my favourite medieval towns in Costa Brava. 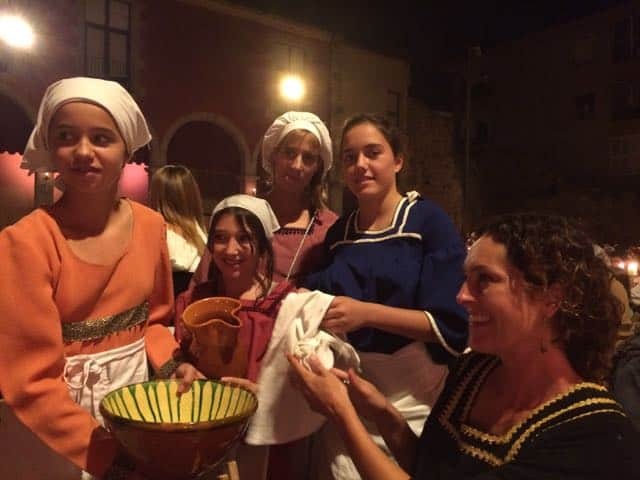 Not normally into medieval festivals, but it looks like you had a lot of fun … great post!